Seaport is rocking around the Christmas tree today while we kick off our Christmas in the City toy drive! Christmas in the City is a 100% volunteer organization dedicated to ending homelessness and poverty on Boston-area children and their families. Since 2010, we at Seaport have been involved with this fantastic group by hosting fundraisers and donating toys each holiday season. 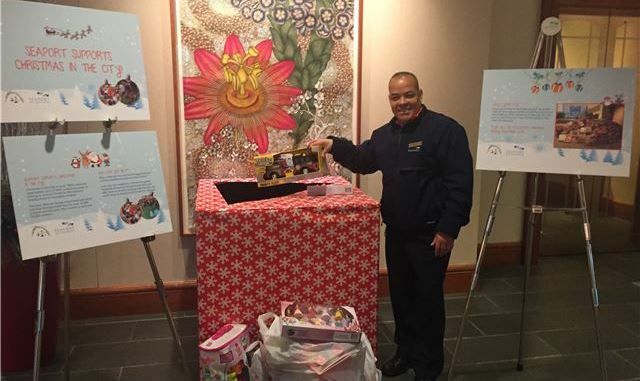 Stop by our official drop-off location in the hotel lobby with new, unwrapped toys between now and December 19th to help put smiles on the faces of over 18,000 children. Our front valet “elves” will be on hand to help bring your gifts inside from your car! We at the hotel will be making a toy donation alongside yours as well as hosting the Celebrity Holiday Tree Auction on December 7th. New England Patriots wide receiver Julian Edelman will join us and read from his new children’s book, Flying High. Guests will also be able to bid on several raffle prizes, including holiday trees decorated by Edelman! Hop on Amazon, grab a few toys, and help spread some holiday cheer this season to those in need!